We had a fabulous day for our final social event of the year. 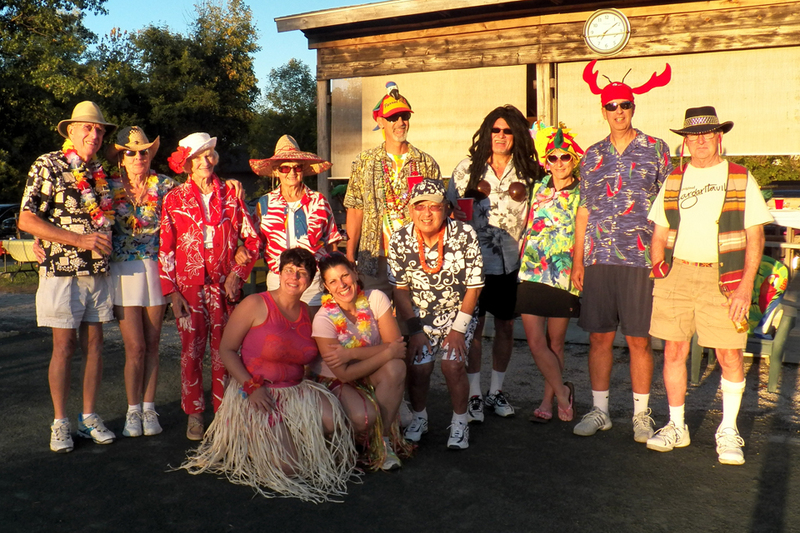 Saturday, September 15 was sunny and warm for the 45 members and guests who came to Margaritaville. Sherri Chavez again did a fantastic job of coordinating this event. A big thanks goes to her and the rest of her helpers: Thanks to Rhonda & Jim Mzik for the great music. Pete and Myra Mitchell made sure there were plenty of Margaritas and beer and soft drinks for everyone. Lynn and Larry Boudon cooked the delicious beans and provided the tables for the event. Judy Schmitz brought delicious and appropriate key lime pies for the dessert. Several people brought coolers to keep everything cold. Larry Boudon ... the grill masters extraordinaire...the burgers were fantastic! The meal featured hamburgers and cheeseburgers, homemade potato salad and green salad, key lime pie for dessert and margaritas, beer, soft drinks ... quite a bargain for $20 per person. Everyone got into the spirit of the event. Some really looked like they should be "wasting away in Margaritaville! Pete Mitchell's Island boy costume won first prize, with Jim Mzik's Parrot Head running a close second. Irene Keyes-Walker’s bird hat couldn't be beat and Helen Boggs and Karen Huhndorff looked like they were ready for a trip to the Keys. Sherri Chavez and her sister Julie wowed us with their grass skirts. If you didn't have any island wear, Sherri was prepared … handing out flowers and leis, and she brought inflatable palm trees and flamingos. It was great fun and everyone had a great time. It was a fantastic way to close out the summer. Great costumes added to the fun! !